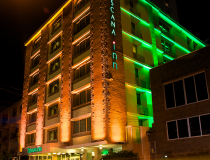 Hotel Toscana Inn is perfectly located in the very heart of Panama City, with dozens of varied dining options, bars and pubs, and entertainment centers such as Casinos close by. The district, El Cangrejo, has a reputation as one of the best places to tour by foot, with wide, leafy boulevards tempting visitors to take a stroll. 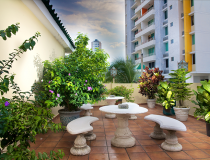 Alongside a thriving nightlife and direct connections to Panama’s most common business districts, El Cangrejo will be both your hub and your home – a relaxing and convenient location to escape the hustle and bustle of the city. Old Quarter: In the spanish colonial City you will visit historic site such as , Plaza Herrea, Boyaca House and Tiger 's Paw, The Flat Arch and San Jose Church, Merced Church , San Francisco de Asis Church , The Iglesia de la Compania de Jesus, The Panama Canal Museum, Simon Bolivar Plaza, French Plaza, Palacio Bolivar , Independence Plaza & The Cathedral Metropolitana, Presidential Palace, Casa Gongora, Club de Clases y Tropas, Paseo Esteban Huertas ,The National Theater, The Emerald Museum, The Fish Market. Mi pueblito: This attractive place is located at the bottom of the Ancon Hill, and offers the visitors beautiful gardens with ferns and flowers proper of the countryside. It is totally paved with river stones and natural flat stone, surrounded by street lamps and houses characteristic of the urban area of the towns. The representation of the rural area is located behind with a typical house made up of mud, straw and canvas with a creole clay roof and a mud floor. Behind the house you may see the furnace, the mud oven, the traditional "trapiche" (cane press) and range raised hens. Panama Canal Tour - Miraflores visitor center: We’ll visit also the Museum, where we can tour around the 4 rooms full of displays. Room #1: Canal history: It portrays the background, technological innovations, and sanitary initiatives that went hand in hand with the construction of the Canal. This exhibition hall honors the hundreds of men and women who made this achievement possible. Room #4: The Canal In the World: This hall provides information on the importance of the Canal to world trade, describes the trade routes it serves and the main commodities, identifies its main users, and allows visitors to get acquainted with the different types of vessels that transit the waterway. Come and enjoy the beauty of Guna Yala Island, this excursion is for the travelers looking for relaxing , peaceful and tranquil surroundings; listening to the sound of the ocean breeze . Our Journey starts from just only a short distance from the Caribbean coast of Panama to Guna Yala Islands (Kuna Yala Island or San Blas Island ), We will be dirving to Carti on the Guna Yala mainland , around 2-3 hours through the jungle highlands, with some spectacular views of Panama’s rainforest. Guna Yala Island is made by 365 island, most of which are uninhabited. The few that are inhabited are home to the indigenous Kuna people, who are known for being completely independent from Panama and its culture; The Kuna have their own music, clothing, economy, medical system, dance, ceremonies and religion. One of the most peaceful things to do in Guna Yala is visit the beaches. There are so many incredible beaches that you can have all to yourself, as there are no people on the majority of the island. The idyllic beaches of Guna Yala as close to perfect as you can get. The colorful reef and exotic aquatic life of the Caribbean make it ideal for snorkeling, and the calm and crystalline waters of the sea are also perfect for swimming . Soft, pure white sand makes the perfect bed for you to rest on in the warm sun, while the tall swaying palms bend over the edges of the sand, providing shade for when you want to cool down. Your day trip starts at around 8:30am when our Tour Guide comes to pick you up at your Panama City hotel. We will drive you through the Panama country side for about an hour. At about 9:30am you will arrive at the boat ramp on the edge of the Chagres National park. The watershed for the canal. Your boteros will be waiting for you with a dugout canoe. It will take approximately an hour to travel up river depending on the season and water level. Sometimes the river is so shallow the boteros have to get out and push the canoe. You may help if you feel like 'roughing it'. Around 10:30am after a beautiful ride up river and through the jungle, possibly sighting toucans, sloths or maybe a monkey along the way. We arrive at Embera Community and are greeted with a traditional musical greeting. After arriving and getting ourselves settled we are allowed free reign to explore the village at our leisure. Then we will be treated to a short talk about their lives and culture, lifestyle, and crafts. After the talk we are taken on a short walk through the jungle with one of the village elders to teach us about the medicinal plants they use. Upon our return to the village we are fed a delicious traditional meal of Patacones (fried plantains) and fried fish . After lunch it is time to listen to their music and watch the women dance some traditional shamanic dances. Next comes shopping time! They make the most exquisite crafts, woven baskets, plates and masks from palm leaf fibers and carved Cocobolo wood and Tagua seeds. Then the entire tribe gathers for a group photo. They are not shy about posing for a picture and love to be shown the result if you have a digital. If you would like to receive a traditional tatoo now is the time. Don't worry it is a fruit juice dye and lasts only 10-12 days before it wears off. Sadly it is now time to say goodbye to your new friends. Do not worry they will stay in your heart forever and you are always welcome back anytime. The boat ride to and from the island passes through the Panama Canal, giving you the chance to spot huge container ships during their passage across the world. If you love active outdoor sports, you do not want to miss the chance to make an exploration of the waters of the Panama Canal with some early morning Panama kayaking. Paddle a kayak and discover what sights the famous Panama Canal holds for you on your journey. Come and immerse yourself in this extraordinary Panama adventure! Recommendations: light and comfortable clothing and visor.